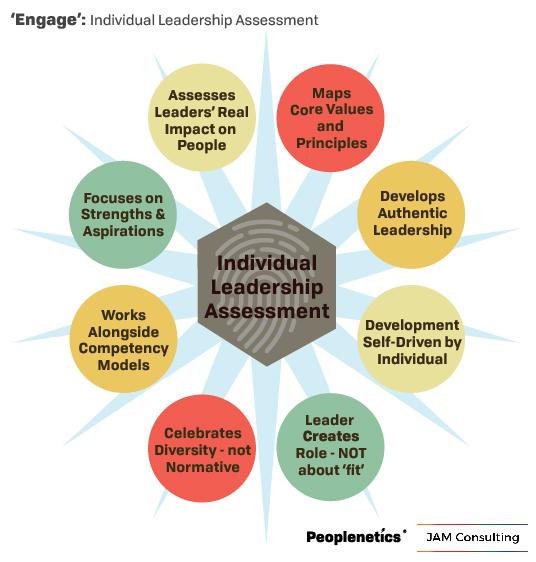 In collaboration with our executive coaching partners at JAM Consulting, we are pleased to launch 'Engage' - a new Individual Leadership Assessment and Development Process. 'Engage' is currently in a beta, pilot format. We have a very limited number of free places on our pilot programme – so please get in touch to check availability. Using the latest thinking related to Authentic Leadership, our approach starts from the unique underlying values and principles with each individual leader, using these to drive powerful development actions. We believe that our approach will lead to greater engagement and better development outcomes - because the commitment to change comes intrinsically from within leaders themselves. Because ‘Engage’ starts from the underlying qualities of the leader, it is less prone to social bias, and celebrates individuality and diversity. The authentic leadership model and theory that underpins our approach will also compliment any behavioural models or frameworks that may exist already within your organisation. Engage is a professional collaboration between Peoplenetics and executive assessment and coaching experts JAM Consulting. Welcome to Peoplenetics Brand New Website that is in the process of being launched. Thanks for dropping by. Do bookmark us, or join up to our newsletter to hear our news. We are planning on finalising our site very shortly and telling more about our work in talent management and leadership development. Welcome to Peoplenetics Brand New Website that is in the process of being launched. Thanks for dropping by. Do bookmark us, or join up to our newsletter to hear our news. We are planning on finalising our site very shortly and telling more about our work in talent management and leadership development. Peoplenetics Ltd.